SIPTU members working for the Football Association of Ireland are asking for an explanation of why they had pay cuts at a time that the organisation began paying rent for CEO John Delaney. The Sunday Times reported at the weekend that Mr Delaney had been living in a house rented by the organisation for €3,000 a month, which the paper said was in addition to his €360,000 salary. On Saturday evening, Mr Delaney announced he was stepping down as chief executive and would be taking up a new role in the association on a substantially reduced salary. In a statement today, SIPTU Sport Sector Organiser Denis Hynes said: "FAI employees were enduring reductions in salary of between 10% and 15%, which were implemented on what was meant to be a temporary basis in 2012. "This issue has particularly incensed our members because when the cuts in their pay were originally imposed, John Delaney stated that he was taking a similar reduction in his earnings. 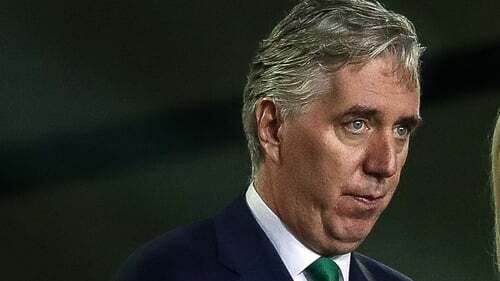 "However, it would now seem to be the case that, in 2016, the FAI decided to reimburse the reduction in its CEO's salary through a payment in kind on a large property. "Our members had to wait until January of this year to receive the final restoration of their pay after long and difficult negotiations between management and SIPTU representatives." SIPTU has called on the FAI to immediately make a statement on its exact financial arrangements with Mr Delaney. The union is also demanding that the FAI board explain its decision-making processes in reimbursing "its adequately paid CEO while at the same time stating that it could not find the monies to restore the earnings of workers who were dedicated to developing football in communities across the country". SIPTU represents staff employed as development officers, coaches and in the administration of the FAI, as well as players through its affiliation with the Professional Footballers Association of Ireland. Earlier, former chief executive of the FAI Fran Rooney said the controversy around the revelation of a €100,000 loan to the organisation from Mr Delaney goes beyond the chief executive. Speaking on RTÉ's Morning Ireland, Mr Rooney, who was head of the FAI for 18 months in 2003-2004, said there were questions for the entire board to answer. He said that governance was addressed in 2002 in the Genesis Report, which stated there would be regular "changing of the guard". However, he said that what has happened is that "almost the same ten people have been running the organisation. He said: "There’s been very little turnover. Basically, retirement dates have been adjusted so that certain individuals were able to stay longer than their original terms of office." Mr Rooney said Mr Delaney should be moving away from the organisation and not moving aside. On Saturday, Mr Delaney announced he was stepping down as chief executive and would be taking up the newly created role of executive vice-president. The association said Mr Delaney would be receiving a "substantially" reduced salary. Mr Delaney earned €360,000 as chief executive of the FAI, a role his has held since 2005. "Good corporate governance would suggest that after six years an individual is gone past their 'sell-by date' on a board like this." Last week, it was revealed Mr Delaney had given the FAI a €100,000 bridging loan. Yesterday, The Sunday Times reported that he had been living in a house rented by the organisation for €3,000 a month, which the paper said was in addition to his salary. Mr Rooney said "what is very strange is that the entire arrangement with the €100,000 loan … that it wasn’t disclosed, but particularly the fact that he [John Delaney] tried to seek an injunction to have it suppressed and to have the article suppressed", referring to an attempt by Mr Delaney to get a court injunction against The Sunday Times publishing a report on the issue. He added: "That raises an awful lot of questions. It’s very unusual. This is an organisation that has extensive banking facilities, so should be in a position to go to its bank for a short-term loan. It’s just very strange. "The fact that it wasn’t disclosed, it wasn’t in the accounts, it wasn’t disclosed at the AGM … there was a whole area of secrecy around it, looking for a court injunction to prevent the article by The Sunday Times being published last week. "The very interesting thing that we should all remember here is that the Football Association of Ireland is a publicly funded body so this is taxpayers' money. It should be disclosed immediately through Sports Ireland, through the department – through Shane Ross’s department." "To actually do something that appears to be hiding a transaction and then appearing later on not only to hide it, but to try to have the matter obliterated … by having a court injunction" needs to be looked at the former CEO added. Mr Rooney said the whole controversy "causes considerable disquiet to the public, particularly those who are forking out hard-earned money to go to games, people who are looking to build the game at grass-roots level. "These are very serious issues to be addressed. "It goes beyond John Delaney. There are questions for the entire board here to answer." The Association confirmed to RTÉ News that it had received an invitation from the Committee to appear before it next Wednesday 3 April and that it is "happy to do so"
The FAI are due to appear before the committee the following Wednesday 10 April. Sport Ireland also said that it has "no knowledge" of any rental payments made by the FAI on behalf of John Delaney. And it says that it has been engaging with the FAI on the matter and continues to do so. Earlier, Fine Gael TD and Sport Committee member, Noel Rock said that Sport Ireland had questions to answer following revelations that the FAI paid the rent of its former CEO. Co-leader of the Social Democrats and member of the Oireachtas Sports Committee, Catherine Murphy, has said she had concerns about the governance of the FAI for some time. Ms Murphy said that any organisation where the board answers to the CEO, and not the other way around, has a problem. Also speaking on Morning Ireland, she questioned the decision to appoint Mr Delaney to the newly created role of executive vice-president. Ms Murphy asked if Mr Delaney would be on the board of the FAI, adding that it would difficult for any new CEO to stamp a new image and authority on the board, if this were the case. Mr Delaney will lead an FAI delegation to an Oireachtas Committee on Transport, Tourism and Sport meeting as planned in April, which Ms Murphy welcomed. The FAI will begin the recruitment process for a new CEO with immediate effect with interviews expected to take place in late April and an appointment ratified by the board in May.